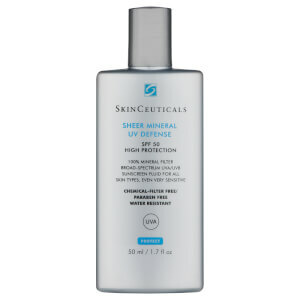 Protect and perfect your skin with SkinCeuticals Mineral Radiance UV Defense SPF 50, a high protection sunscreen that safeguards skin while enhancing natural radiance. The weightless fluid utilises 100% mineral filters to provide broad spectrum UVA/UVB protection, and delivers a universal tint to enhance your skin's natural tone. Suitable for even sensitive skin, the water-resistant sun lotion will leave you looking healthy and glowing whilst shielded against the damaging effects of the sun. Suitable for normal, combination dry and sensitive skin. Free from chemical filters and parabens. Shake then apply generously before exposure to the sun. 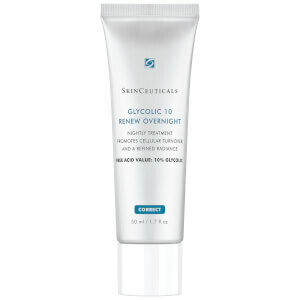 Re-apply frequently, taking care to avoid the eye area. As well as using sun protection, it is essential to take additional precautions when exposed to the sun. Aqua, Titanium Dioxide [Nano], Isododecane, Dimethicone, Undecane, C12-15 Alkyl Benzoate, Styrene/Acrylates Copolymer, Caprylyl Methicone, Nylon-12, Butyloctyl Salicylate, Phenethyl Benzoate, Tridecane, Dicaprylyl Carbonate, Silica [Nano], Triethylhexanoin, Isohexadecane, Dicaprylyl Ether, Talc, Dimethicone/PEG-10/15 Crosspolymer, Aluminium Hydroxide, Stearic Acid, Pentylene Glycol, PEG-9 Polydimethylsiloxyethanol, Dimethicone, CI 77491, CI 77492, CI 77499/IRON OXIDES, Aluminium Stearate, Phenoxyethanol, PEG-8 Laurate, Magnesium Sulfate, Caprylyl Glycol, Alumina, Polyhydroxystearic Acid, Disteardimonium Hectorite, CI 77491, Diethylhexyl, Syringyldenemalonate, Tocopherol, Propylene Carbonate, Artemia Extract, Benzoic Acid, Disodium Stearoyl Glutamate , PEG-9. 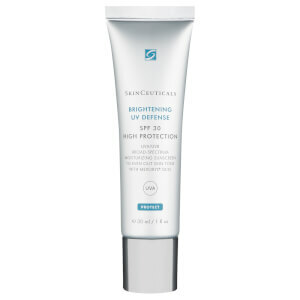 Best sunscreen ever, it protects, it gives an even tone to the skin and it smooths it! Wearing this I feel comfortable to go outside without any makeup, and I have suffered from severe acne and rosacea. It makes the skin look super fresh. The price is high but you're protecting your skin so there's no second thought there. It has become my holy grail. Provides perfect cover with optimum high end skincare technology with a mineral broad spectrum uv defence. Invisible on, just smoother, better skin, natural and radiant. Had lots of compliments since using this. It’s is sheer, which is why I love it but with concealer touch up when needed, it’s perfect.